Two weeks ago, the conference CHI’17 has ended which was located in Denver this year. Besides of attending interesting talks and meeting inspiring people, we had the opportunity to present our project “Tactile Drones” at CHI. Tactile drones are small levitating tangibles, which deliver tactile feedback in VR . This happens whether by explicit stimulation through an object (e.g. a stitching wasp attacking the user) or by users interacting with drones. Objects in VR are therefore simulated by such drones, thus increasing VR experiences. Check out the video below for more impressions. 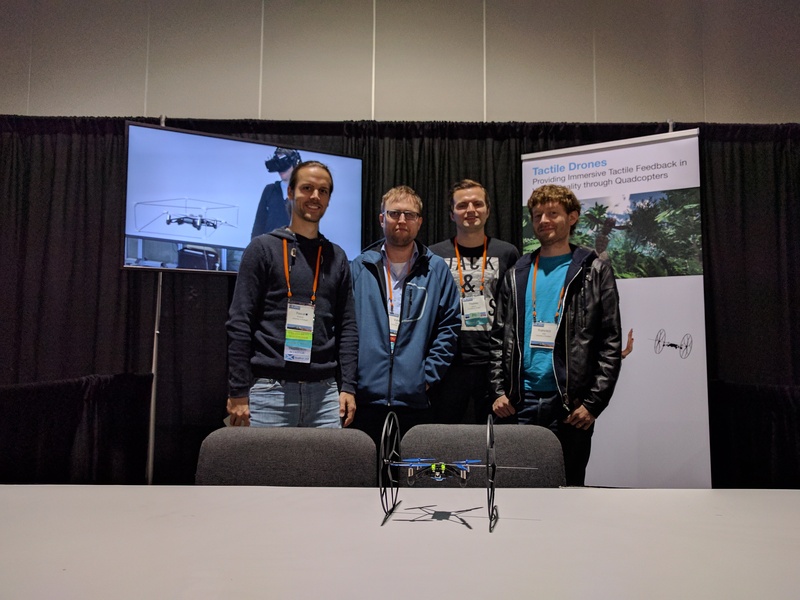 : P. Knierim, T. Kosch, V. Schwind, M. Funk, F. Kiss, S. Schneegass, and N. Henze, “Tactile drones – providing immersive tactile feedback in virtual reality through quadcopters,” in Proceedings of the 2017 chi conference extended abstracts on human factors in computing systems, New York, NY, USA, 2017.